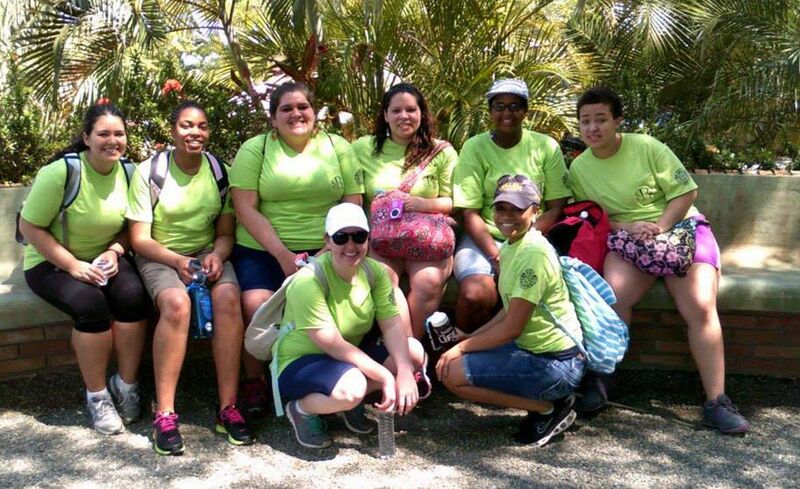 A group of students from Salem College’s Rotaract Club dedicated their spring break volunteering in the Dominican Republic. This trip, planned in conjunction with the Winston-Salem Rotary Club and Mission Emmanuel, was the student organization’s second. Shannon Salzman and Kadijah Ward co-chaired the trip and were joined by fellow students Tammy Flores, Katie Hildebrand, Ashley Snow, Krystal Gidtrey, Samantha Nava, and Nikki Lowman. Lindsay Tharpe, a 2011 Salem College graduate, also attended as the Mission Emmanuel trip leader. Students traveled to Cielo, Santo Domingo, and facilitated a two-day workshop for expectant and young mothers to help educate them on topics such as breastfeeding. Another service project, working to rebuild a home, gave the students experience in painting and plumbing. While in Cielo, they also visited a local school and served in a pediatric clinic. In one of the most transformational experiences of the trip, students visited a leprosarium, where they sang to bedridden patients. The group, returning to the United States, brought back a renewed sense of connection and a true understanding of selfless service. Salem’s Rotaract Club plans to send more students to the Dominican Republic in 2016. The Salemite, Salem College’s student-run newspaper, interviewed trip attendees about their experience in an article that can be viewed here.